I usually use this weekly post to link to recipes I used that week or post my own recipes. As I explained in an earlier post, we recently started eating a Paleo diet for medical reasons. Basically, Paleo means eating lots of fruits &veggies, lean meats and fish, eggs, nuts and seeds...but no grains, dairy, legumes, or processed foods and only small amounts of natural sugars. This week, I am reviewing a Paleo cookbook, Against All Grain: Delectable Paleo Recipes To Eat Well and Feel Great by Danielle Walker. I ordered this cookbook because several friends had recommended it, though the title seemed a bit militant to me at first. As it turns out, the author also has an immune disorder similar in some ways to ours (Ulcerative Colitis in her case), and she has improved her health and quality of life tremendously by eating a Paleo diet. I was intrigued right from the introduction! The book evolved from her popular blog of the same name. The design and organization seemed a little odd to me at first, with separate chapters for breakfast and for things that kids like and a picture-based recipe index that is not alphabetical, but I'm getting used to it. I have been doing pretty well on my own with dinner ideas that are Paleo, with a focus on our usual meat or fish plus two veggie sides instead of some sort of grain or potato. If you read this blog regularly, you also know that I've done well with using my favorite Cooking Light recipes, with some slight modifications. Cinnamon-Raisin Coffee Cake (I added chopped apples to the batter) - delicious! Even my son who doesn't like cinnamon and my other son who is decidedly NOT eating Paleo both enjoyed this. Currant Scones (I substituted blueberries for the currants since blueberry scones are one of my son's favorite foods; I subbed ghee for palm shortening, I also cut the amount of honey in half and added a bit of stevia) - wonderful! A lovely treat after not having any bread-like food for months. Our non-Paleo son admitted they were pretty good, and our restricted son was thrilled to have one of his favorite foods. Sun-Dried Tomato Rosemary Scones (we left out the sun-dried tomatoes because we didn't have any on hand) - we made these on a whim one night just before dinner. I had made homemade soup, and my husband really missed having biscuits or crackers or bread with his soup. He and I both loved these! They were wonderful with soup. Non-Paleo son was NOT impressed - ha ha. "Peanut Butter" Cookies - (we used butter instead of palm shortening because it doesn't seem to bother us and again cut the honey in half and added 1 teaspoon stevia; also, I omitted the lemon juice and baking soda and used baking powder - I know it's not strictly Paleo). Two of the things our college son is missing most are peanut butter and cookies. Poor kid sees tables full of cookies and other sweets every day in the dining hall and can't touch them. We'd already discovered sunflower butter as a sub for peanut butter, and he loves that (is currently going through a jar a week and keeping me running to Trader Joe's!). These cookies were very good. They are a bit drier than cookies made with regular flour and not quite as crisp on the outside, but they are chewy and tasty and definitely fill that cookie-sized hole in his diet! My son liked them so much that he drove home from campus in the middle of the week this week and said, "Teach me how to make those sunflower butter cookies so I can take some back with me." Ganache Tart with Toasted Hazelnuts - (again, halved the sugar (maple syrup in this case) and added some stevia to replace it) - I made this to take to a potluck dinner for a group of families who all have sick kids. Lots of food intolerances in the group, so the ganache was a big hit! Kind of like fancy fudge - very rich and chocolatey. Chocolate Fudge Sauce - I made this when my son was home for spring break and served it with sugar-free ice cream from our local dairy (he's not supposed to have dairy but this was a special treat!) and Avocado Paleo Brownies (again using half the syrup and subbing in some stevia) - yum! His favorite dessert is a brownie sundae, so this satisfied his craving. I had mine with vanilla coconut ice cream. Waffles - (I left out the honey or syrup and subbed a teaspoon of stevia; I divided the eggs into whites and yolks, mixed the yolks in with the rest of the batter, beat the egg whites until soft peaks formed, and then gently folded the egg whites into the rest of the batter - this is a classic waffle approach that makes the waffles lighter and more tender) We just tried these this morning for our special Easter Sunday breakfast, and everyone loved them! Even my younger son who is somewhat anti-Paleo and won't touch the Paleo pancakes I usually make on Sundays, enjoyed these waffles, so that is high praise indeed. We topped them with chopped bananas or pears, chopped walnuts, maple syrup (sugar-free syrup for the restricted son and whipped cream for the non-Paleo son!). Definitely a keeper. Roasted Garlic Mashed Fauz-Tatoes - This has been our only dud so far from this cookbook! We have tried subbing pureed cauliflower for mashed potatoes, and the three of us on a restricted diet like that. This pretend potato approach uses celeriac which I finally found at Whole Foods after searching 3 other stores for it. Admittedly, I didn't follow the recipe exactly because we really hate fennel, so I left that out. In any case, none of us liked this. I might try celeriac root in other recipes, for instance cubed in soups or stews instead of potatoes, but I think we're done with the mashed variety. So, you can see, we have mostly tried sweets, treats, and baked goods and enjoyed just about everything! I am looking forward to trying the Paleo bread recipe and some of the entrees, but so far, this cookbook has been well worth the price. 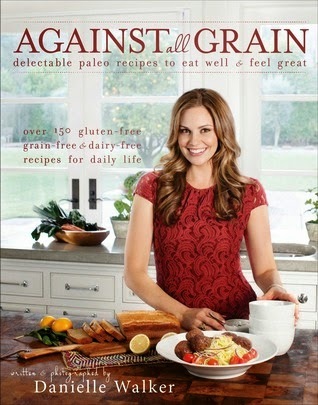 You can check out the Against All Grains website for some sample recipes. We are veering slightly from the strict diet today for Easter. We each had 1 Peep with breakfast (a family tradition!) and will include a few pierogies (another family tradition because my family is Ukrainian) with Easter dinner tonight...along with lean, natural meats and lots of veggies, of course! Happy Easter and enjoy some good food today! These recipes sound amazing even if you aren't on Paleo. What great treats. I am going to have to try this in my ongoing battle wanting to go Paleo but not because my underweight boys need the carbs and calories! 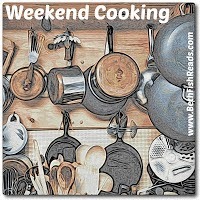 Thanks for sharing with Weekend cooking and hope you link up with SmallVictoriesSunday this week! It's a pity the tatoes didn't work out, but the rest sounds good. Excellent job on finding treats and bread substitutes. Sorry about the celeric. Maybe you should give up on it. We like it. I've cut it up for use in soup and stews instead of potatoes. But we pretty much eat everything. I like Sunbutter better than the Trader Joe's brand of fake peanut butter (I have a mild peanut allergy). This book sounds amazing! Love the recipes you mentioned! They look REALLY good! I am going to buy this book! Thanks for sharing on #SmallVictoriesSunday!